Appalled at first at what he’d done to his healthy young body, I’ve realized now why the tattoos are important. I don’t recall the word “tattoo’’ ever uttered in my house growing up, but when my second-grade teacher, Miss O’Neil, handed out mimeographed sheets with purple ink drawings in one column and a purple list of professions in the other, I knew to draw the line from the picture of a serpent on a man’s biceps to the word PIRATE. When my 17-year-old son started wearing a T-shirt along with his boxers instead of strutting around the house bare-chested, I feared he was hiding a tattoo, but I couldn’t imagine what it depicted. Writing and drawing on your body was far worse than graffiti in my world. My grandfather had a paper company. When my grandparents came to visit, instead of toys, they brought reams of white paper as gifts. If you asked my grandfather, “Why did you choose to sell paper, Sam?” he’d puff on his cigar and say proudly, “Paper is a good clean business.” I’ve always felt a similar affection for paper, the look of it, the smell and the feel. To me, writing on paper is a hallowed act, with all due respect to trees. “Mom,” said my son in his suddenly deep man’s voice as he opened the refrigerator one morning and took out a quart of orange juice. “Mom, I have something to show you,” he said before brashly drinking from the carton. He smacked the container on the counter and lifted his T-shirt with real pride but also knowing it would cause me alarm. 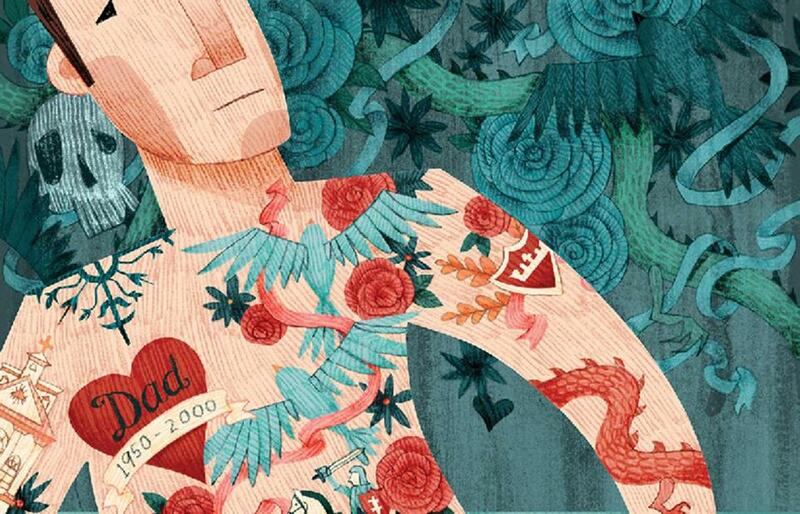 On his chest in bold black ink was his father’s name and birthday in 1950 and death day in 2000. My son had sneaked out a full year before the legal age of such activity and spent several hours in an inking parlor far from our home. I don’t know if he noticed the tears in my eyes, for both the existence of the tattoo and what it commemorated, because he was calmly explaining how he needed to use A+D ointment on the ink until it fully healed. My son had a “difficult adolescence” — a euphemism for “excruciating for both of us.” The Amish might tenderly call this time Rumspringa, but the words my son and I sometimes hurled at each other in those years had no hint of poetry and in fact cannot be printed in this reputable publication. It was true that I felt some sense of reverence — how could you not, at seeing the dates of when your husband dies too young and your adopted son is abandoned once again by a parent? But I still found the idea of permanently writing on one’s skin disturbing, a defilement of his healthy young body. Years have passed. My son is a grown man, living out west with a good job and caring friends. He is not a pirate. We talk to each other kindly now, and he has other tattoos — elaborate drawings and inspirational quotes. Last month when he was home for a visit, he showed me his latest, of an intricate 16th-century gate in Lithuania — where we adopted him when he was 7 months old. I suddenly felt as if I were reading my son again. I understood that each of his tattoos represents a way of figuring out who he is in the world. When his vacation was over, he had an early flight, so he left before dawn. When I awoke that morning, I found a handwritten card on the kitchen counter thanking me for all kinds of things. It was on top of a gift, a fresh pack of white paper. I write books while my son writes his story on his body. Who knows, maybe one day he’ll write a book, and don’t be surprised if you see a short older woman with tiny tattoos of a typewriter and the Lithuanian word for “family” inked on her shoulder.